Facts about Harlequin Rabbits. The Harlequin Rabbit is a multicolored rabbit breed that originates from France. It is a rabbit variety that is based around the coloration and marks, instead of their fur or type of body. The conventional Harlequin Rabbit breed is part orange or white and part black or some other color. The Harlequin Rabbit has an even blend of both colors and they ideally contain a half-and-half coloration on their head. "Scientific name for Harlequin Rabbit is Oryctolagus cuniculus". "Fear of Rabbits Leporiphobia". All rabbit breeds are "lagomorphs" various plant-eating mammal of the order Lagomorpha ; a hare, rabbit, or pika. The Harlequin Rabbit breed was first introduced in France during the 1880’s and it has been recognized in the United States since the 1920’s. The original name for the Harlequin Rabbit breed was the Japanese, but that was rapidly dropped during the World Wars. Nowadays, the Harlequin rabbit breed captures several people’s attention, but fights to keep up a following of dedicated breeders. The Harlequin Rabbit is an average-sized rabbit and usually the female rabbits are heavier than the male rabbits, with the body weight that ranges from 7 lbs to 9.5 lbs (3.2 kg to 4.3 kg), whereas the male rabbits weigh between 6.5 lbs and 9 lbs (2.9 kg and 4 kg). This rabbit breed is recognized as a separate breed by both the American Rabbit Breeders' Association and the British Rabbit Council. The Harlequin Rabbit comes in two categories, such as Magpie and Japanese. Japanese Harlequin Rabbits are usually orange and combined with either blue, black, lilac, or chocolate, whereas the Magpie types of Harlequin Rabbits are white and combined with either blue, black, lilac, or chocolate. An ideal Harlequin Rabbit will be divided between the two colors on their ears, head, body, and feet. It is a kind of look similar to a perfect line between the two colors. Some Harlequin Rabbits will have a white or orange colored belly. 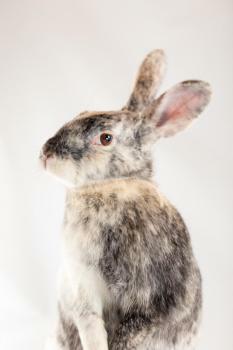 The ears of the standard Harlequin Rabbit breed will have two different colors. The face of the rabbit divides into two colors, which interchange with the ears. The front legs and the chest divide into two colors, which interchange with their face and match their ears. The back feet will interchange with their front feet. They have body markings that are either bands, bars, or a mixture of the two. The Harlequin Rabbit breed was created from partially-wild Tortoiseshell Dutch Rabbit breeds. Originally, the Harlequin Rabbit breed resembles a poorly marked Dutch Rabbit breed. The Harlequin Rabbit was initially exhibited in the 1887 Paris Rabbit show. Then, they were then imported into England after some years, where the Harlequin Rabbit were exploited for meat during the Second World War. The Harlequin Rabbits are nicknamed as the joker of the rabbits, owing to the color partitions and markings. The Harlequin Rabbit breed is docile, playful, and clever. Similar to the majority of rabbit breeds, the Harlequin Rabbit breed can react to its own name and even be litter box educated. They are calm, and this character makes the Harlequin Rabbits the ideal pets for kids. The male Harlequin Rabbit is called a buck and a female Harlequin Rabbit is called a doe, also both known as a bunny. A young rabbit is called a kit "kitten" or baby bunny. Harlequin Rabbits have long ears which can be as long as 4 in" (10.2 cm). Harlequin Rabbits are herbivores (a herbivore, eats leaves, grass, hay and furns (plant eaters) and also mammal. Harlequin Rabbits are born without fur and its eyes are closed. Half of the rabbits in the world live in North America. Harlequin Rabbits are comfortable living in groups. European rabbits like to live in burrows underground. Warren is known as a group of burrows. Cottontail Rabbits are the only rabbit that does not live under ground. Harlequin Rabbits have an outstanding sense of vision, smell and hearing. Having eyes on the side of their head and being so big, gives them nearly 360 degrees vision, allowing them to see predators from all directions. The Harlequin Rabbit can see everything behind and in front of them and have just a small blind-spot in front of their nose. Pet Harlequin Rabbits should be kept in pairs for Companionship, its important for a Harlequin Rabbits happiness and it can live longer with a companion. In the wild, rabbits are very social. Female Harlequin Rabbits can produce about 2 to 4 litters of bunnies per year with 4 to 6 babies. Harlequin Rabbits love to run and can reach speeds of 30 to 40 mph. The average lifespan of a Harlequin Rabbit is around 5 to 8 years and in captivity can live up to 10 years. Harlequin Rabbits have 28 teeth and an incredible fact, a Harlequin Rabbits teeth never stop growing throughout its life. Harlequin Rabbits can jump up to 36 inches (91.4 cm) and sometimes higher. Rabbits are very clean animals and will groom themselves and also each other. Harlequin Rabbits are crepuscular-(meaning the are most active at morning and evening) and do most of there feeding in the evening. Harlequin Rabbits on average sleep about 8 hours. For bedding, give Harlequin Rabbits wood pellets or aspen. You can use pelleted horse bedding. Do not give them pine or cedar. Clean the cage with either white vinegar or a cage safe cleaner; don’t use bathroom cleaner or other things that are toxic for the pet cage. De-worming is a major concern and should be done in the spring and fall. A pea sized amount of de-worming paste in the rabbit's mouth is sufficient for the Harlequin Rabbit. Harlequin Rabbits as pets enjoy wet food, carrots, hay or lettuce, dark leaf lettuce is good. (Iceberg lettuce contains too much water and too little fiber to be suitable.) Limit giving them fruit with sugar in it. Alfalfa provides the high caloric content necessary for baby bunnies development. Once Harlequin Rabbits reach seven months of age, gradually switch them over to timothy hay, oat hay, or orchard grass. Avoid giving them yard clippings, since grass is often sprayed with fertilizer, insecticides, pesticides, and other chemicals rabbits should not be eating. Their diet should consist of 70% of timothy hay and make sure they have fresh water every day.